When I first ventured into the Marketing Analytics realm so many years ago, analytics were simple. All we needed to know was how many visitors made it our site and from where, and then how many of those converted to trials and sales. You can easily satisfy marketing stakeholders by slicing these conversion rates into their area of focus, be it Affliliate, Online, Email, or Offline to name a few. But, over the years since I have to say that Marketing Analytics have evolved into quite a profound and somewhat complicated science that is even more fascinating. As time passed and companies struggled to control Customer Acquisition Costs (CAC) and Marketing budgets got slashed at the same time, Marketing execs found themselves having to dig deeper for a few reasons. First they had to justify their current CAC by tapping into the Finance metric of Customer Lifetime Value (CLTV). They then had to dive into cancellations to understand Drop Rate to see how many of their new customers were “sticky” versus “loose” (we called these net zero customers, who purchase and leave in the first month). It used to be that Revenue was key, but many Marketers have learned that Revenue metrics are slow to respond to changes in the acquisition funnel. Hence the need for Drop Rate and CLTV by acquisition to compliment conversion rates. But then a fundamental shift in marketing came just a couple years ago. Social media is the latest marketing fad. The most difficult thing about this fad is the lack of measurement. Facebook “likes”, Twitter followers, mentions and wall updates are extremely difficult to translate into a monetary return on investment (ROI). Successful companies have invested a lot of into creating and maintaining their brand, which pulls money away from more traditional and easily measured channels. While cancellations and CLTV are not directly impacted here, the health of a social media campaign can only be judged by how much it enhances the brand. Along side our conversion rates, we see “interaction metrics, such as responses to tweet and wall updates. You see, if your social media guru is posting stuff that your customers do not comment on, your guru is not a guru. Not only do marketers have to know if your customers interact on Twitter, but they also need to know how their customers use their products. So, marketing should have readily available metrics from the CRM/product/content teams such as % usage rates, % support calls, as well as product personas. If your company uses the Net Promoter Score, heck, marketing should have access as well. What does Marketing Analytics look like today? Well, those conversion rates are enhanced by post acquisition metrics. However, it isn’t as easy as it seems. In order to provide marketing with the enhanced data sets they need to compete in today’s corporate world, they need the support of Business Intelligence & Web Development teams to tie everything together. There is nothing worse than having a great product and not knowing anything about your customers because no one ever thought to implement unique customer tracking on the website. While Marketing Analytics today are a bit more complicated compared to a few years ago, it is a fascinating place to be. Marketing is one of the few departments that really need a global view of the company, the product, and the customer to succeed. As an Analyst, this viewpoint is a goldmine for data geekery. When wast the last time your Marketing team looked beyond conversion rates? One of the keys to getting customers hooked on your SaaS product is offering a free trial. Letting someone experience your product for free for seven to thirty days is a great way to establish trust with the potential customer, let them experience the product, and also gain insight into how they will use the product (customer segmentation). On a recent project, I was reviewing data for a client and noticed a very interesting pattern in the login histories (not really, but we will call it logins since the real data can’t be shared) for trial users. This particular client offered a 7-day credit card trial with auto convert to a selected plan (i.e. monthly or annual). What I expected was a nice curve from day 1, declining each day, relatively smoothly and then an increase in logins after conversion. However, after summarizing the login data for the first ten days of service (including 3 days for the auto convert), I found a sharp decrease in logins from day 1 and day 2, as well as a blip on day 6. See the chart below. The chart is quite simple, a single line with 10 data points. What isn’t simple is really what this data means. In fact, I don’t think we can make a decision directly from this data. 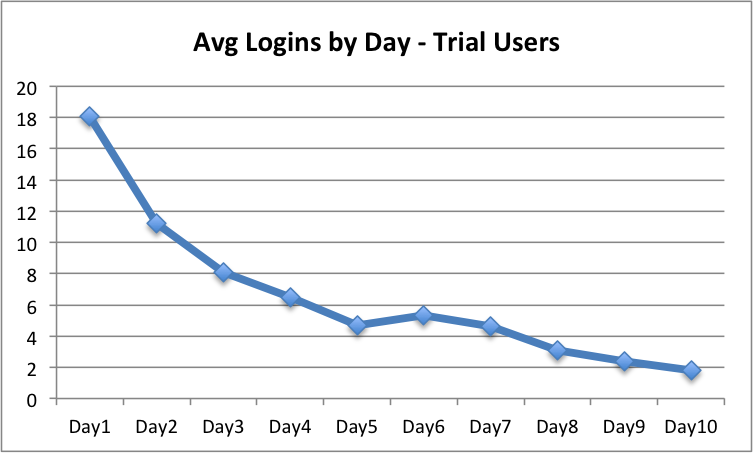 Rather we need to further understand what the trial users are actually doing on day 6 and how users with logins on day 7 compare to the users on day 1 (is this a bad a marketing channel). It would also be great to dive into patterns of logins just prior to churn or trial cancellation. What fascinates me the most, is not only the different perspectives on the data, but the deeper questions that come out of the data. Data and customer insights are evolutionary. The more you know, the more you ask questions and the more the decisions and knowledge evolve. A gift does not have to be big nor expensive and it must be given without any expectation of something given back in return. Receiving a gift from someone, be it advice, an unexpected phone call, or even a small quarter can be powerful tool. It triggers those warm fuzzy feelings that makes us feel great. It makes us feel like we are valued and respected. Gifts should be a regular part of any customer experience. Whether you give the gift of top notch customer service, free products, or incredible ease of use, gifts can separate you from the competition. Today, I received my package from Starbucks containing two packs of their new VIA ready brew instant coffee. It is not available locally here in Santa Barbara until the 29th of September, but you can order it online. I am impatient so I order one pack of Italian Roast and one pack of Columbia and had it shipped. This was my first time ordering from StarbucksStore.com. Opening the box, I was surprised to see a wonderful appreciation message with warm regards and a free pack of After Coffee Mints. After digging through the package and extracting my goodies from the peanuts, I realized that something was missing from this Starbucks experience. It was the detail of refined packaging with a human touch. 1) The appreciation letter is printed and feels more institutional. Perhaps a signature at the bottom from someone at Starbucks would make it more personal and make me feel like I am reading something more important than an insert. 2) Opening the box and finding peanuts is old school and does nothing to inspire me to order again. If Starbucks is going to use peanuts, be creative! Why not use peanuts in the shape of lattes or coffee beans?? Make the experience unique and you make it personal. While I am extremely pleased with my order, transaction, and buying experience, I expected a more personal, unique experience from Starbucks. Nothing stood out to me unpacking my order… so un-Starbucks. I firmly believe that if you have fun with the details and provide the customer with a unique experience, they will love you forever! Communication can be a powerful thing. Communication can bring synergy to the workplace. Communication can save customers and increase revenue. Communication can get you a raise. Communication can get you through traffic and avoid congested areas. Communication can get politicians elected. Communication can make us happy. What can communication do for you, personally, professionally, or romantically? Today on Seth Godin’s blog, Seth posted a bit of a rant titled The End of Dumb Software. Seth brings up some great points about access Notes and the logic behind 2 am meetings. Perhaps it has become time for software to be a little more intelligent and user friendly. I am surprised that a company like Apple has not already given intelligent software with logic. One of the most important qualities to companies is that their customer have confidence in their product. So, how do you build confidence in your customers? Simple, honest, heart-felt interaction. Remember, customers are human and do not like unexpected occurrences. Communicate with your customers frequently regarding product upgrades, changes, service windows, and even outages. No one likes being left in the dark. Look at it as an opportunity to have fun and communicate in creative ways. When something goes wrong, be creative with your apology. Heck, who can get angry at Twitter’s whale or Cox’s Digi. The more effort you take to talk to the customer and inform them, the more they know you care and that is confidence inspiring! Let your customers go, but be sad about it. Holding a customer hostage is not going to help them or your business. Allowing your customers to leave when they want, opens up the front door and builds their confidence. No one will buy a car that they are going to be stuck with. When they cancel for reasons within your control, listen, listen, listen. While you lost them now, making it clear that you heard them loud and clear during cancellation gives them confidence in returning later. Let them leave on a heart-felt, positive conversation. By following some simple rules, you can build an overwhelming amount of confidence in your customers. So much so, referrals may some drive more business than your outbound marketing campaigns. If so, this is the best compliment a business can have… you know your customers are confident in your business, interactions, and product.